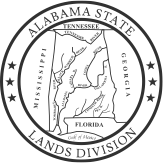 The Alabama State Lands Canoe Trails offer canoeists and kayakers alike the ability to explore the State's unique natural resources while providing paddlers with opportunities for both day and over-night trips. 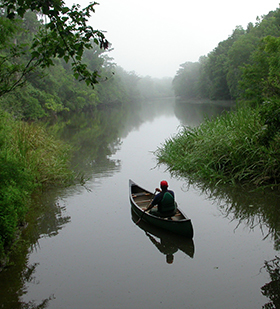 There are 170+ miles of trail located along the Bartram Canoe Trail in the Mobile-Tensaw Delta and Perdido River Canoe Trail. 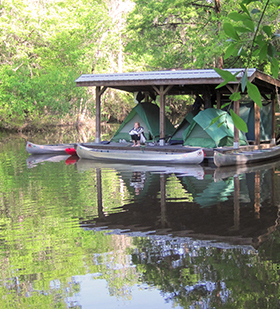 The Bartram Canoe Trail offers the option of camping on reserveable floating platforms and pile supported camp shelters or primitive land-based sites with trail access starting from the 5 Rivers Delta Resource Center or at one of many local landings. 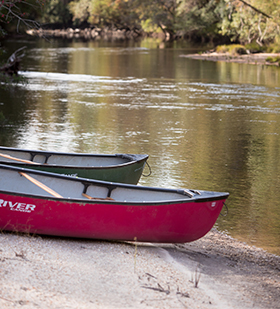 The Perdido River Canoe Trail offers reserveable land-based shelters and allows for primitive camping at several sandbars. Access to the trail is from one of three landings located within the Perdido Wildlife Management Area. This project is funded with qualified outer continental shelf oil and gas revenues by the Coastal Impact Assistance Program (CIAP), Fish and Wildlife Service, U.S. Department of Interior.